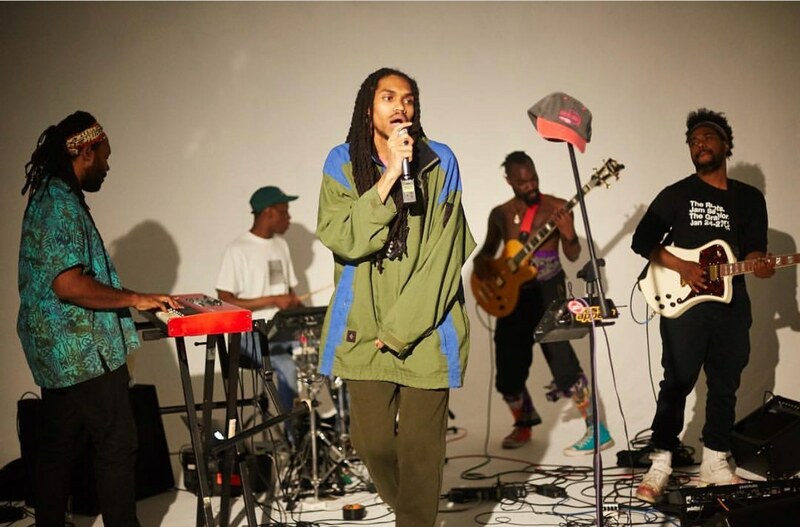 Recently, I got a chance to catch Brooklyn based hip-hop soul band Phony PPL at NYC's historic BlueNote Jazz Club. I’ve followed this awe-inspiring group for the past three years. First, let me say I am always amazed at the genius level of artistry, lyricism and musicianship the group displays in their songs and live stage performances. When it comes to music and storytelling, these guys really do seem to have "crash-landed from another planet." The band is L-I-T, and the best part about seeing them live is getting to witness five young, uber-talented musicians, who each play at least one instrument, rock all the way out on stage! It's literally creativity in motion! The genre-bending band’s lead singer, Elbee Thrie, did more than just sing though. He engaged the audience in a back and forth conversation about what "keeping it real" really means today as a hip-hop group, and he shared some of the personal highs and lows he and his bandmates have experienced while making their highly-anticipated follow up album (due out any day now) to the hugely popular Yesterday's Tomorrow, released in 2015. Elbee, or “Threece,” as he calls himself, hinted at the bouts of emotional turmoil, frustration and painful ego shedding it took to get the album written and recorded. Clearly it was a process not to be rushed and, of course, with the manifestation of any great work, a little pain can and should be expected. But their story got me thinking about my own life and the processes I go through when working hard to move beyond something difficult, push through a big project or simply deal with delays, disappointments and pain. As passionate co-creators of our lives, a challenge is often inevitable. But this night, Phony PPL served as a reminder to keep thinking outside the box and to keep pushing beyond your limitations when you’re on the verge of birthing something new within you! It doesn't matter if it's an album, a website, a book or a relationship, committed action mixed with a whole lot of patience will get you there. However, it won't happen by sheer will and determination alone. How we talk to ourselves, and how we think and respond to the issues we face, is super important and crucial to remaining grounded in the middle of these fruitful, growth seasons. So, what should our thoughts inside look like when everything outside appears out of alignment? 1. Everything is always working out for my good. There are no mistakes. Everything happens for a reason. Trust that and you have discovered a major "secret" to living a balanced life. 2. What’s for me will always come to me, and it will come in divine timing. You don't have to push or try to control things. In fact, the more you "let go" of expected outcomes, the more things can easily flow your way. Release your death grip on life. 3. God’s rejection is also God’s protection. If one thing doesn't work, it's because there is another way or a better way. Let this perceived loss take its course and get busy moving on to the next thing. Trust it will evolve even better than expected and it will. 4. I am the creator of my own reality and no one can take anything from me. You are the master of your life, meaning you are responsible for everything in it. Each and every experience, good and bad. No one can create that for you, therefore no one has the power to make you feel or do anything, unless you give that power away. Use this principle as a reminder to stand in your power and to drop the victim mentality as soon as it comes up. No blame. No guilt. No beat up. 5. I can’t do everything at one time, but I can do all things one at a time. Stop rushing trying to get it all done at one time. Work hard and do what needs to be done when it needs to be done, but enjoy the process! Stay present. Focus on what you want vs. what you don't want, and then take inspired action. Watch things begin to magically move for you. Saying these principles out loud and to myself helps ease any fear, stress or anxiety, and shifts me back into a mindset of positive focus.